The Polhemus Livery Stable occupied this site from 1874 until 1909, when it was demolished to provide space for a post office. Architect Fremont Ward directed construction work which followed plans drawn by the architecture staff of the Treasury Department. Built in the popular Beaux Arts style, the building was a handsome adaptation of a classic Italian Renaissance palace, with its symmetrical formality, rectilinear characters, absence of roof form and strong horizontal lines and elaborate decorative detailing. As the building began to take shape, photographs and reports were sent monthly to the regional headquarters in Chicago. Initially the building formed a square with entrances on all four sides. Although the building was extended on the east side in 1926-27, and enlarged again in 1933, the additions were so carefully crafted to match the original design that today it is impossible to detect the changes. Everything was done to maintain the same external appearance: the smooth-cut gray limestone, the neo-classical revival features, including the sculpted garland architraves and the scroll work on the frieze about the windows, were all matched to the original. In addition, the interior retained many original finishes, such as marble wainscoting, terrazzo floors, ornate plaster moldings on the sixteen foot ceilings, and the wonderful wood trim. 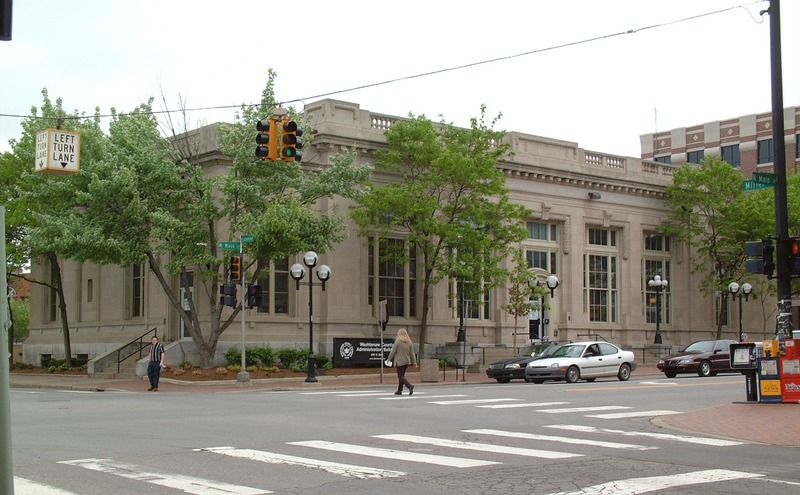 The building served as Ann Arbor's main post office until 1959 when its replacement on West Stadium Boulevard was completed. In 1977 the downtown post office was moved to the new Federal Building on East Liberty. Washtenaw County then purchased the building and restored it for its administrative offices.